Digital Beats Analog, or Does It? The world is abuzz with the brave new digital world. What used to be laborious and time consuming, inefficient and unreliable is now effortless, efficient, ultra-reliable, blisteringly fast and hip, a mere matter of pointing and clicking. 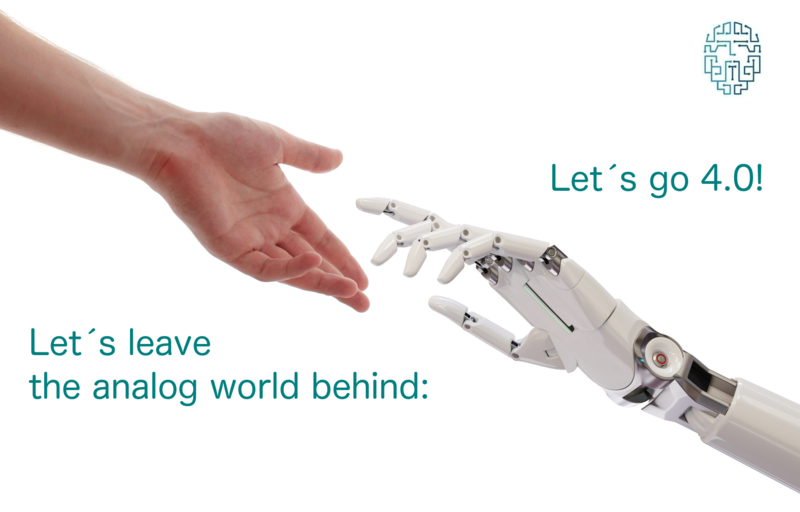 Let’s leave the analog world behind us, let’s go 4.0! Is that what we want – sucking the analog world into a maelstrom of digitization? Is that possible, and to what extent? What would it mean anyway, and what is it that distinguishes the two worlds, analog and digital? But before all, let’s clarify where the word analog comes from. Besides the digital computer there was once an alternative: the analog computer. It didn’t work with ones and zeros but with graded signals. They were ingenious machines, but went out of fashion. But the name stuck: analog the antithesis of digital. Apart from the name, what characterizes the analog world? In it, humans do things manually. “Manual” is another shorthand. Hands most often do play a role in human operations, but more importantly manual operations need a human’s effort and time and above all focused attention! A simple example is writing down the name and coordinates of someone you meet. This involves understanding spoken words or reading from a piece of paper and writing or typing – it takes time and it is error-prone. In the digital version, your new friend just moves his device near your device, you both touch an icon, and done! With ultimate speed and, above all, accuracy! And this is just a trivial example. The real difference comes out when large numbers of operations are involved, such as sending a message to thousands of recipients or looking up of information on data banks containing zillions of entries. The digital world enables operations and fields of activity that are just plain impossible in the analog world of manual operations, and if it were only for quantitative reasons. A slippery slope towards a fully digital circus? Will the analog world of human activity thus be washed away by the digital revolution? Will we all lose our jobs? Is the world on a slippery slope towards a fully digital circus? Not so fast. Digital operations don’t make any sense without humans, and digital systems are still totally dependent on the analog world, in terms of design, production and maintenance. It could be that the fourth industrial revolution will digitize even the production of devices, but design and maintenance will remain in the analog domain in spite of better and better digital tools employed for those ends. The ultimate reason for that is that our digital machines by themselves contain nothing whatsoever that relates to meaning or purpose in the human sense – or in any sense for that matter. The success of an IT-based startup company, to pick a relevant context, rests on two aspects, one is the functionality of its digital implement, the other is success in the marketplace. Judging the latter ahead of time is very difficult and has to be based on insight into human habits, tastes and interests as well as social dynamics, all deeply analog issues. Maintenance and debugging of digital systems (or of any technological artefact) again has to rest on the human ability to compare actual with intended functionality and to manage diagnostic and repair processes. The more digital systems nibble away at the analog world the clearer we can see what is left for humans to do and what it is that creates resistance to automation. The decisive human faculty is situation awareness. When a problem comes up, when a novel situation, actual or imagined, needs to be dealt with, the human mind is able to assemble and bring to bear all ideas and elements relevant to the situation. Relevant elements may be extracted by perception from the situation, may be found in the mind itself, or may be the result of directed search. The process may take seconds or minutes, or it may days or years, depending on the novelty and complexity of the task. Being aware of a situation means organizing the assembled material under some general schema. Solving a mathematical problem in an exam, preparing a dish in the kitchen, safely getting through a traffic situation or carrying on a conversation are all governed by their own schemas. A schema is a collection of elements, held together by explicit representation of their relations (“links”). When a schema is applied, its elements and relations are connected with (or “mapped unto”) elements and relations within the specific situation, such that schema elements are mapped onto scene elements of the same type and links of the schema are mapped onto links in the scene. Schema activation, selection of appropriate scene elements and linking up of the two must all be realized as a dynamical process (a process I will attend to in the next blog). A major behavioral schema comes equipped with elements of emotional content, elements that can direct attention or that are wired up with humoral and motor controls. In this way scenes acquire concrete meaning and are turned into stages for purposeful action patterns. Animals and humans are born with a basic repertoire of pre-wired behavioral schemas, as described by ethologists and infant psychologists. In the process of growing up schemas spawn more concrete and detailed versions, a process intensely enriched in the human case by education. The dynamics of schemas in our mind, their development and their weaving into all our activities and thoughts may be seen as the substance of our lives and it is all we care for. Automation and digitization are means to ends, ends that are defined on our emotional level. They help us to get rid of tedium and to concentrate on activities that are important to us. Drawing the line between the two – what we want to do ourselves and what we want to get rid of – is an enormously complex subject. As long as mechanization, automation and digitization liberated us from toil and drudgery the choice was easy. On the other end of the spectrum we don’t want to let cheering in the football stadium be taken care of by robots. But there is a middle ground, a gray area, and making up our collective mind about where to put the limits to automation needs intense discussion that is to be informed by what we have to expect from artificial intelligence in the future. The decisive question here is to what extent the inner sanctum of the human mind’s involvement in this world, its ability to endow it with meaning and purpose, will be penetrated by artificial devices. If technology manages to break into this citadel the discussion will have to take on a totally different level of seriousness. One may then speak of childhood’s end. What are the chances of this fundamental revolution to come to pass, what are the barriers that stand in its way? Stay tuned. towards a fully digital circus? The Future of AI is Analog!